1. 700mAh battery and 2ml refillable cartridge. 3. 1.3ohm coil that is optimized for nicotine salts. 4. Innovative and leakage-free side-fill design. Eleaf iWũ Kit is a portable and compact pod system starter kit, including 700mAh battery and 2ml cartridge. 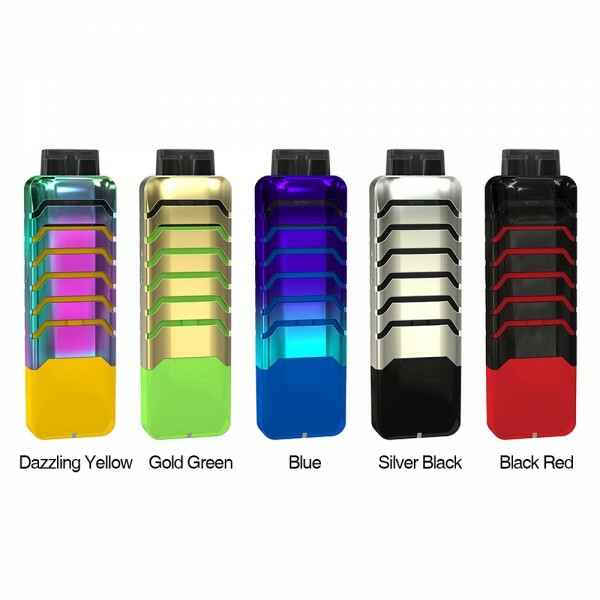 It is easy to use with no-button design, which automatically initiates when you inhale. The LED light on the bottom cycles through four colors shows the battery level intuitively. Designed with a retractable hollow-out cover, it can conceal and protect the mouthpiece. The pod comes with innovative and leakage-free side-fill design, making refill easier. And it has a 1.3ohm coil contained within the pod that is optimized for nicotine salts. 1. Comes with 700mAh battery and 2ml refillable cartridge. 4. Designed with a retractable hollow-out cover, it can conceal and protect the mouthpiece. 5. Comes with innovative and leakage-free side-fill design, making refill easier. 6. 1.3ohm coil contained within the pod that is optimized for nicotine salts.